I received my Isetan Newsletter last week but a lot of my readers haven't so I'm goin to briefly talk about it here coz IT'S SO DAM IMPORTANT. It's a Share-Fish kinda thing (instead of Sell-Fish). I will try to scan my newsletter tomorrow in office to put it up for everyone to see. For now must settle for a summary version okay? Basically on Friday @ New Year's Day 2010. Isetan KLCC, Gardens & Lot 10 having BIG BIG LUCKY BAG Promotion/Event. I have never heard of LUCKY BAGS before! Isetan say Fukubukuro (Lucky Bag) is a Japanese New Year's Day custom where merchants make bags filled with unknown random contents and sell them for a substantial amount. 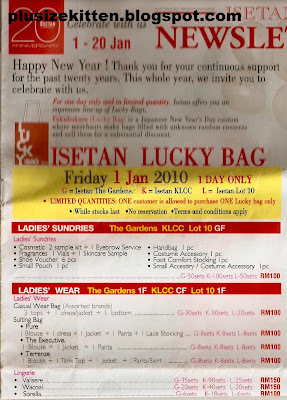 SO the Isetan Lucky Bags will range from cosmetic, clothing, children, supermarket, household lucky bags merchants with price starting from RM50-250 depending on which lucky bag category. Since I am a beauty crazy shopper.. i will show a lucky bag example on Cosmetic merchants k? 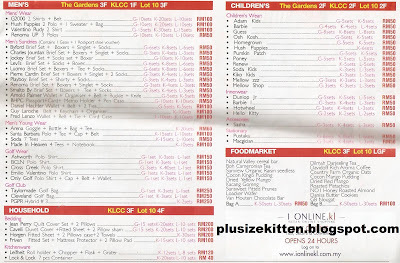 Gardens 50 sets, KLCC 100 sets, Lot 10 50 sets = at RM100. Limited quantities: one customer = one lucky bag only! while stocks last. No reservation. Terms & conditions apply. so nice of u..sharing this info..
Is for everyone, or members only? is it open for isetan members only? You can get all those stuffs you listed with just RM100??? happy birthday miu....today is your birthday rite?